Charles Henderson High School basketball player and Rutgers recruit Maori Davenport can play in her team’s game tonight thanks to an emergency motion by a Pike County Circuit judge. Until today, she had been ineligible for her senior season due to USA Basketball’s fuckup, which was compounded by the Alabama High School Athletic Association’s ridiculous interpretation and enforcement of its own policies. On Nov. 30, Davenport, a senior, was informed that the AHSAA had ruled her ineligible for one year. She had played for the United States in the FIBA Under-18 Women’s Americas Championship over the summer, so USA Basketball sent her a check. Despite the NCAA’s obsession with the perception of amateurism, college players can accept national team money. For high school players, though, the rules vary by state. In Alabama, the payments can’t exceed $200. Davenport’s father Mario cashed the $857.20 check, and USA Basketball didn’t figure out its mistake until two months later. When Davenport’s mother Tara was informed of what had happened, she repaid the money to the organization and also self-reported to the high school and state association on Nov. 28. There was no illicit scheme here. 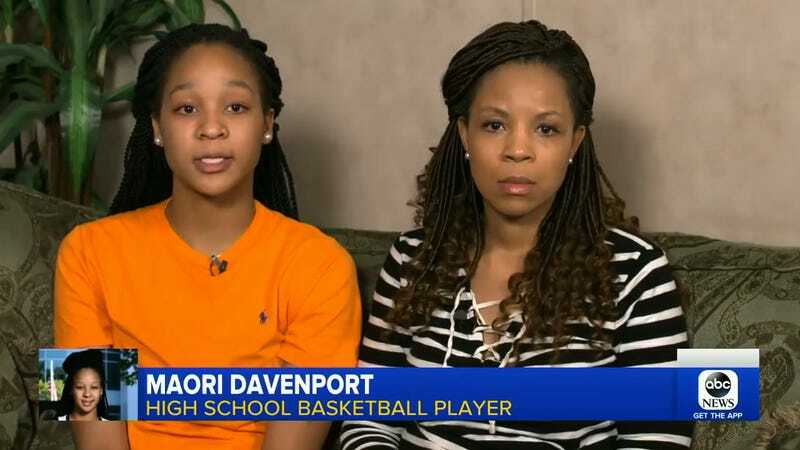 USA Basketball admitted the mistake, and Maori Davenport said her parents called her coach to make sure she could cash the check and got approval. The money was repaid and the Davenports informed the school of the mistake, so there was also no coverup. After again referring to his 44 years as an educator, I asked him what lesson is to be learned from this case, and at whom the lesson is aimed. Wow. I had to let all of that sink in. I felt like I had just been lectured by the Alabama equivalent of Avery Brundage, the former president of the International Olympic Committee, the AAU and the U.S. Olympic Committee who was so often considered to be on the wrong side of history regarding athletes due to his inflexibility and antiquated thinking. After losing every possible appeal within the AHSAA’s system, the Davenport family filed a lawsuit this week against the association and Savarese, asking the court to invalidate the ruling, which was the reason for the emergency motion. Maori Davenport can continue to play her senior season until Pike County Circuit Court Judge Sonny Reagan holds a hearing for the case. She’s expected to play tonight against Carroll High School.